Get your Spirit Cheer and Polka Dot bow! This bow is so peppy and upbeat that it will perk up any outfit. 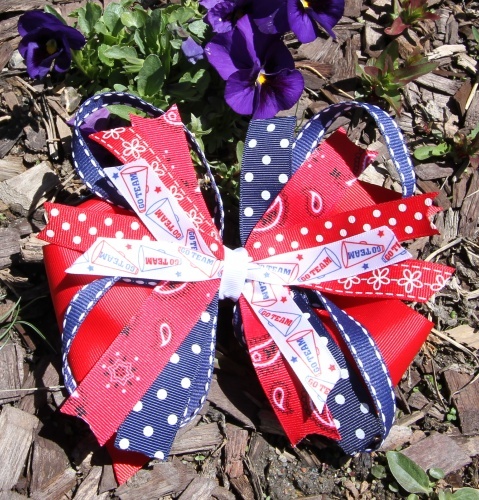 Great colors of red white and blue will let this be your Favorite American Holiday bow and the cheer print makes it a great spirit bow for cheer or any spirit day for school. Polka dots in navy and red print come out of the pinwheel. Paisley, flowers, and cheer megaphones also decorate the center. Four loopers of navy with white stripes drape over each side of the red grosgrain base bow. Show your spirit with this fun loving pinwheel bow.